More Sky Better: Are Your Bike Shoes Killing the Planet? Are Your Bike Shoes Killing the Planet? 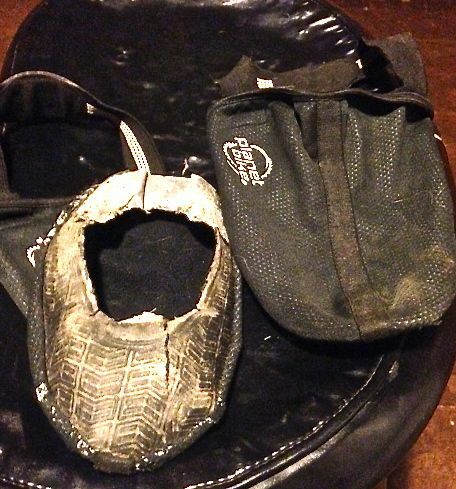 I was online last night, excited about shopping for a new pair of shoes for mountain and dirt-road biking. This popular brand… that arcane brand… flashy colors… sticky soles… which one, which one? 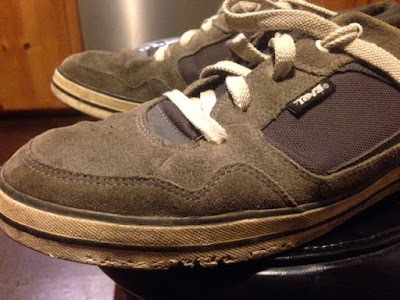 As I closed the laptop, a thought cropped up: someday, the shoes I buy this month will be as old and trashed as the Tevas I’m replacing now. Where will they end up? In a landfill somewhere, probably. Too trashed to donate, and not recyclabe. In the interests of being a titch less consumerist and polluting, I wore the Tevas a whole year beyond their practical lifespan. They held up well, but there is zero support in any direction now. They come off my heel like a pair of slippers. So I wondered: could I make a choice that would be more environmentally friendly? Perhaps natural materials would help? Not really: harvesting and processing leather (and the suffering of the animals that produce it) is so filthy it would offset any loss in chemical pollution created by synthetic options. Perhaps a shoe made of recycled materials? Good luck finding it. The truth is, gear is highly costly in environmental terms. The processes and materials leave toxins in the air, water, and probably even the ground, whether in the U.S., or much further abroad. Factories and shipping methods also contribute to global warming. (That’s not even getting into ethical questions, like how well factory workers are paid and treated in far-flung lands.) This article points out that weatherproofing fabric can be just awful for the Earth—and for humans. Other companies over the years have made a nod to conservation. See this article from a few years ago for a few examples—and some suggestions at the bottom (ranging from practical to ridiculous) for reducing one’s general ecological footprint as a biker. Some of these, we should all be thinking about, such as: if your ride starts within a few miles of your house, ride or carpool to the rollout point. One of the more commonly used consumer approaches to conservation (perhaps because it also serves as a bulletproof rationale for buying the best) is spending more for gear that is built well and lasts. I have two pairs of high-end knickers that have each been through hundreds of rides and show not the slightest sign of wear. They won’t be in a landfill or the rag bin anytime soon. The strategy I love the most these days is simply holding on to gear until it’s truly beyond salvation. After years of steadily replacing gear, I sat up one day and thought about the money I’ve spent, and where the old gear must have wound up. Last fall, I repaired a pair of toe covers for my cycling shoes; the rubber on the bottom had all but disappeared, and the sides were basically flapping in the wind. I applied layers of duct tape (I know -- not ecologically spotless either), and scissored out space for my cleats, and I’ve now squeezed an entire extra season out of them, with more to go. Nobody sees the bottom of your toe covers, right? Likewise, I’ve fabric-glued ribbons onto zippers with busted pulls, mended holes in expensive wool socks (and speaking of wool, it might be the single most environmentally friendly gear choice you can make, not mention that it’s flawless technically and gets you cool points). I’ve rubber-banded fenders to stop rattle (and avoid replacing them) and left them that way for months. Really, jury-rigging gear is one of the most time-honored and satisfying of the cycling black arts. These days, I get more excited about my friend’s old puffy jacket with the duct-tape patch than I do about a flashy, brand-new one I spot for the first time outside of a catalog. The worn one has a stories to tell, and my friend loves it enough that he won’t give it up, even with that big, grey Band-aid on it. Let’s not forget the mother of all ecological commitments: keeping the bike you have instead of selling it up the river for a hot new one that’s 200 grams lighter and features the latest (soon-to-be-outdated) hub size. After buying (or, often, trading in for) no less than six bikes in nine years, I’ve pledged not to think about a new bike this year. When you keep a bike a long time, you develop a relationship with it no new bike is going to beat. I'm hoping to experience more of that. Another option is buying used. Two of my four bikes -- and it may be no coincidence that they’re my two most-ridden -- were purchased this way. You can get tremendous deals with this approach if you know what you’re looking for. It certainly was the only possible means for me to get a high-end, full-suspension mountain bike like my Pivot Mach 429, which, in the end, made me a better and more passionate mountain biker. I mention that because I’d never heard of Pivot until i started looking at used bikes; I was only checking out the Specialized and Konas offered new in the stores near me. So, while the green options for shoes might not yet be as broad as they ought to be, we do have means to reduce our impact. Almost no one judges you for riding in, or on, old stuff. If they do, they should be giving you power-ups for being handy, frugal, and environmentally friendly. If not, I wouldn’t want to ride with them, anyway. Post your favorite ways to reduce your cycling footprint in the comments, below.